Preheat oven to 175°C/350°F. Add blanched almonds to a baking sheet and toast for approx. 7 - 10 min. Remove from the oven and let cool. 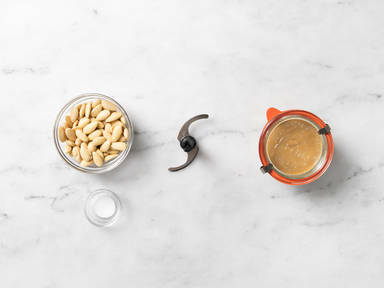 Add cooled toasted almonds to a food processor. Process for approx. 10 min., or until creamy. Season with salt and continue processing for approx. 30 sec. Transfer almond butter to a jar and use for baking, cooking, or as a spread. Enjoy!